10'000 miles. Nautical miles. Yeeesssss! Who expected that our journey would become so long? With gratitude for our ship (I can not call it a boat anymore, it just feels wrong) and our partnership we celebrated the start of our 10'000st nautical mile. Very decent, with a glass of white wine - unfortunately I banged my had on the engine room door short after that. Do you know our engine room door? Well, it's a pretty thick and solid steel door. I have to confess, it prooved to be more stubborn than I am. So with an aching head, we made it into Fiji - where the wind suddenly picked up from 8-12kts to 20-25kts. Here the pics of the crossing. Fiji requests that you send in a pre-arrival notification form for your ship. Two responses reached our mailbox: a thank you and receivement confirmation as well as a „non-deliverable“ indication stating the recipients „mailbox is full“. Thus we were a little nervous if the inward clearance would be smooth and easy. As we had sailed through the night, and contrary to the days before the wind was blowing, we arrived early. Even to arrive „only“ short before sunrise we had to drop all sails - luckily we were going pretty much downwind, anyway. So to reach our „target speed“ of 3kts the mast and rig were sufficient in 20kts of wind. Drifting thus towards Levuka we waited for the first sunlight before entering the pass through the reef. Just under staysail and with a little support of the engine we entered Levuka anchorage early in the day. Soon enough the radio was transmitting the customs message if we would like to clear inwards. Of course we did, so the customs told us that health inspection would be soon around to check our ship. The health inspection turned out very friendly and easy. A brief walk through the ship, a few forms filled in and we brought the lady back to the dock by dinghy. A bit unlucky, she got all wet in the short and steep waves within the reef. We got wet, too, but still decided to do the clearance immediately. So we sat down in the customs office and got a friendly welcome. Of course it took some extra time to find the mail. However, the process was easy and the people gentle and very welcoming. So was the bio inspection which was part of the clearance. NZ and AU seem to have set a standard for many of these pacific nations. All of them care what comes into their eco-systems. I remember that in Switzerland we had issues with a Japanese beetle that destroys trees … maybe we should improve. In order to finish the clearance we had to pay for all these services in Fiji dollars. The bank and ATM was around the corner, but payment for the health inspection was at the hospital. Turns out this team also checks hotels and relevant businesses. They also educate villagers regarding waste and dengue. As the hospital was at the other end of the village, we had a nice stroll through the former capital of Fiji. Levuka is even registered as a UNESCO site. The local museum revealed that the town had not only noble history but was a place to host any type of character in the times before. It seems the wild and adventurous westerners were, partly also pirating the area, were pushed farther away by the civilized and missionaries. Wild, wild west, we guess it must have been. Today a few old buildings of the era as capital still remain, but the main economic driver now is probably the fish cannery. As in my hometown the sugar mill, the fish cannery „stinks up“ the whole town in certain weather conditions. The first hours at anchor we got a little taste of it. Provisioning was also needed, so we strolled the shops, bought papaya, tomatoes, Fiji fruit etc at the small market and finally dropped the backpack in a little restaurant. Gastronomy is OK here, prices way better than in French Polynesia, the cuisine quite a bit better, especially any Indian. Fijians and Indians have a history here, too. We did not notice too much but certainly loved to see the posters against racism - and respect for other religions. I guess „the Western World“ should get some of these posters up again, too. The news we see via our 4G internet are worrying. As a world traveller all these prejudices against other people and the anxiety being fostered are just disgusting. Talking of prejudices: friendliness is a prejudice for Fiji as well. Maybe the one prejudice many other countries should earn (or earn back), too? To see our friends from Merrion we leave in the afternoon in 20kts of SE wind to head SSE towards Kandavu. The sail turns out perfect. First a bit upwind with small enough waves, then half wind with gusts to 25kts straight at the target. Nicely reefed for convenience we still made 7-8kts on average. Only the anchor suffered a bit - whenever the bow digs into a wave or crashes down onto the water until the anchor sinks into the sea, the anchor is slapped upwards banging into a guard rail. Of course that is the purpose of the guard rail. Still, it’s always like a hammer, a big hammer, that hits the iron. Just noisy, not harmful. However, we tie the anchor down for longer passages. AIS is mandatory for all big vessels. Still, at night we often see a radar echo first. Then the lights appear somewhere in the dark. And finally an AIS signal reaches our transceiver and we see the ship and its direction on the chart plotter. Very convenient, but it would be much better if the Fiji captains would run the AIS all the time - not only once they notice there is another, non-Fijian, vessel under way. Talking chart plotter, we notice again how easy cruising has become. With todays precise navigation and ever improving charts, we feel safe to run at night. Even though we are well aware of the „satellite navigation assisted“ accidents. Already in British Columbia we found ourselves in areas where the charts were inaccurate - and were labelled accordingly. Here, we always cross check the chart, radar and visual landmarks. So far, this has worked well. In Kandavu we go snorkeling, beach walking and try the sevusevu. The sevusevu is the welcome ceremony by which the visitors pay the respect to the village and it’s representative chief. Depending on location, it is a full ceremony or a rather informal talk. Here, it was abrief talk and handing over kava, a root that is powdered and then mixed with water to end up as a relaxant drink. It seem alcohol is not the only substance that is used to enhance rituals … done that, we went spear fishing and checking out the reef. Corals are nice, visibility very good, but big fish are hard to spot. So we moved on from the Namalata reefs towards the Astrolabe reefs. A day sail north is the bay of Solotavui / Kavala. It’s well protected but the chart looked suspicious: anchorage in 0-16ft of water. Usually, anchorages are deeper. Furthermore a big part of the bay is marked 0-16ft. So we keep positive spirit, assuming we would find a spot - wherever in the bay. Under way a flock of birds was diving for fish and something was in the water, too. As we were under engine in weak wind, we turned around, crossed through the birds’ path and hauled a big eye tuna aboard. Yummie! Merrion had caught a mahi-mahi. That called for a fiest in the evening! However, first Isa had to filet the fish as my ellbow was hurting. Then we also had to find a spot to anchor in that bay - and do sevusevu. As assumed, the waterlevel was deeper in the area where the anchorage was indicated and we dropped the hook in nice, fat mud, so that Merrion could raft alongside. Their windlass was out of order and anchoring by hand is strenuous. The walk to the village turned out to be super nice and the village itself very Fijian. The chief greeted us, invited us into his home, accepted the kava we brought along and then told us they actually find other items more helpfull. Kava is grown mainly in the Kandavus … nevertheless, we walked away with some lettuce from the chief’s wife’s garden and great memories of this encounter. It was not a ceremony, but certainly very respectful and interesting for all. The reason to get to Kavala was the waterfall hike. The chief and the shop’s owner had given us brief directions. However, we ended up at the school which serves multiple villages and thus is about 3km from where we anchored. Helpful as they are, a man walked with us to the settlement of the family that „owned“ the waterfall. Instead of sevusevu with kava we were asked for sevusevu with money, 10 Fijian dollars each. Turns out a young member of the family takes us to the waterfall. And very best: shows us where to jump from the cliffs! So we walk the tropical vegetation, a little uphill, then into a valley and to a pond with waterfall. In the humid heat the cool water is wonderful. Even though the pond is not very big, it is proven deep. The young man asked us if we want to jump from the cliff. Sure, I said and off we went climbing a bit above the pond. Level 1 first, then level 2 as we have proven ourselves, too. Big fun! Well cooled we wandered back and had another great evening with mahi-mahi and tuna. Activities continued next day as we asked a local fisherman to take us out to a pass to free dive. With the pastor on board the 5m outboard driven boat we round the island and hop into a world famous diving area. We are spoiled, we feel, as we again miss the variety of fish we had seen in the Tuamotus. However, soft corals are something found here, not there. The drop off at the edge of the pass is spectacular, so we enjoy a hours of snorkeling. After that all the boys go spearfishing- With two handfulls of fish we head back to the ships. We keep a few of the fish and leave the rest to our guide and driver. A final evening in that by green surrounded bay and we lift anchor next day. Merrion heads to Vuda Point while we explore Astrolabe area some more. Jiust four hours sailing we find a nice anchorage in the wind protected side of an isalnd within the Astrolabe reef. On the nearby island is a luxury hotel and with that a cell phone antenna. How lucky, it provides us with 4G superfast internet like at home. How great to do all the communication and preparations to get work from that picturesques anchorage. We had been waiting for the reply to a job application and it turns out to be positive! However, it’s very entrepreneurial, a.k.a. not out-of-the-box but shape-it-yourself. Besides working on that new opportunity we of course called home, sent mails, updated the blog etc etc while also exploring the reefs and islands by dinghy and snorkeling. With fresh food running out we decided to move on to Suva, to see the capital of Fiji. Following a big freighter we entered the pass to Suva harbor. This few hundred feet wide pass must feel a tiny hole for theses freighters. For us it was convenient, but still we were careful and reminded of the bad things that may happen here: Suva harbor is littered with wrecks, starting at the pass, adding up inside the reef with vessels that draged anchor and got pushed onto the reef. Suva boast some tall buildings and malls. We were not used to this type of city anymore. We drove to the yacht club who operates a dinghy dock, to see town. In the museum we studies the war canoes and their sophisticated sailing technique, in the Grand Pacific Hotel we enjoyed an iced mocha in stylish modern-colonial atmosphere, downtown we shopped drinks in the mall and veggies in the great market. A special treat for Isa led us to Pure Fiji, a spa. Long, long ago the queens, a.k.a. Marta and Isa, decided to do a spa day. It did not materialize until Fiji, where Travis and I acoomanied our admirals to the spa. Not at the same time, though, as Merrion had stopped in Suva two weeks before us. Social life at the yachtclub started in the evening. Ship crews and locals enjoyed the cold, cheap beer. And we bumped into Deyan who took responsibility of Picton Castles engine room. Well, not only the engine room, all engineering on and below deck. Picton Castle is a square rigger, two tall masts, a long steel hull way bigger than ours but also a bit older. Sailing with cotton canvas and natural lines, no dynema etc, this ship serves as training vessel for 40 trainees and 12 crew. Deyan invited us to see the ship and we were hugely impressed. By the ship but also by Deyan’s work. He was hired thanks to his education as Polymechanic, a Swiss apprentice. As I had learned, small ships require broad range of knowledge. As Polymechanic Deyan was certainly in a great starting position and he also learned quickly - ships teach you. The engine room looked very good, given it’s age. Deyan left his mark, for sure. It was wonderful to meet this young fellow Swiss adventurer. Great spirit, well educated, open personality, that’s what’s making it out here. Always fun to meet such people. Leaving Suva we headed out upwind, 20-30kts. We wanted to test our heavy weather capabilities again. The rout required one tack, then following the coast close upwind after leaving the harbor. Being pushed towards a reef would have been most uncomfortable, so the point to tack was a challenge to determine. With chart plotter as help and steady wind we managed to follow exactly our desired route: 2.5 miles off the reefs, going at the maximum wind angle we could, leaving just few degrees of flexibility. With the rain and bad visibility this would have been foolish to do without modern technology. We passed the outermost marker of the reef as planned, but any mistake would have been difficult to correct. Fun it was and lucky we are! We turn towards Levuka, were we had cleared in, in similar conditions as we arrived: 20-30kts wind from SE. This time we have no reason to delay and we go north with steady 8kts. While the waves splash over deck and sometimes the spray washes over the pilot house we sit comfortable in the dry. Both of us are tired from the ship’s movements, so as soon as we are off watch we sleep. That started already in the early afternoon and continued into the night. Though going through this area requires always full attention: the reefs of the big Fijian islands extend far, and the gap inbetween them narrows from 8 miles at Levuka to 1 mile at the narrowest. We pass this narrow part at midnight. The red and green markers are flashing in the distance. The charts are accurate, as we have seen around Levuka, so we head right in the middle. The wind leaves us no margin, with 155 degrees wind angle we manage to squeeze through. Looking at the GPS track it must have been pretty much in the middle. Two options require the skippers attention: going straight to the Yasawas or stop along the big island to relax. As the wind is still strong, even increasing to 35kts at some times, the early stop seems a bad idea. We would arrive at night. So we decide to go on, with the wind as much in our back as possible, following the Bligh Water’s surrounding reefs. Indeed I do not want to gibe too often with these strong winds and in the second reef only. The peak loads on the canvas when the sail slashes from one to the other side are considerable. Not that I really fear something would break, but long term maintenance is always a factor to keep in mind, too. So we take the „gibe as few as possible“ approach. With intense searching for more options we find a bay that is 2 gibes closer and 3 hours faster than our original target. So in the early morning hours we get closer to the wind, following the corner of a big atoll, to head to that anchorage. Still going 8kts I had deployed the fishing gear even though I did not like to catch a fish. Hauling it in and killing it under way in these waves would not be fun. However, a fresh fish is just too tempting. So I ended up filleting a mahi-mahi shortly after turning around that atoll, while Isa was carefully watching the depth sounder while we were approaching a shallower part of our leg. As we did not trust the charts entirely we also kept good watch for strange wave patterns that could have indicated a submerged reef. No such signs ahead, so we aim straight at the anchorage. One last piece to solve: getting the main down. In 30kts wind and short steep waves not the most fun job. I have to go forward, climb a bit up the mast to get the sail down and locked. In the meantime the engine runs at high speed to maintain a few knots agains wind and waves. Only with enough speed the vessel can be kept well into the wind. So Isa and the autopilot share duties while I get the last yards of sail down. Turning our back to the wind we pick up speed as the bare mast drives us with 3kts towards shore. Three sets of charts have indicated this is a pass through the reef and reality proves it, too. So we anchor soon at the village of Naburkeru and see the chief for sevusevu. Sevusevus seems to have gone very informal at places with enough visitors. It’s a brief chat, handing over some goodies, not necessarily kava, showing respect and also getting as much information about the place as possible. So we see the village and the church with the chief and he explains us how they build the traditional houses. I like their looks but have to agree with the chief that building them needs way more workers than the contemporary building style. The hills around here are without any trees, so I ask the chief about it. He explains that there was a fire. Not entirely sure if that would have led to that look we shake hands and go back to the boat. Time for a good rest to explore the area the next day. Hiking up the mountain reveals how dry the soil is here. So it’s no wonder there are only few trees and a lot of grass land. The warmth of the sun is held back in this furry, long grass. While our legs don’t feel the wind as they are covered by the grass, the upper part get’s cooled by a nice breeze. Amazing, how the grass acts as an insulating layer. We feel like fleas walking on a big furry cat :-) Asides from that, we enjoy the great views over several lagoons, reefs and villages. Later the day we dinghy-explore the turquoise lagoon just in front of Jade Akka: a shallow, white-sand area enclosed by palm trees and fringed by old volcanic rock formations. The reef turns out to be pretty damaged, probably due to warm water, and does not keep us busy for long. So we decide to head on, sail again in strong winds to make it into that manta ray place farther south. Getting out of the bay proves more challenging than expected. The wind on our nose, waves bashing our bow the engine running at high speed and the mainsail up for stabilization we make slow progress only. Even though the charts are inaccurate I decide to tack against the wind through the pass. Visibility is good and the wave patterns are well recognizable, so underwater structures should become apparent. Close to the wind and thus a little more power from our main sail we zig-zag out of the bay, keeping the dangerous reefs as far away as possible. Once out, we have a broad reach and steady sailing - steady in a sense that we do not have to work the sails anymore, not that the ship would not have been rocked by the waves! We are excited and exhausted by the time we made it and enjoy the rest of the sunshine day sailing towards Naviti, where I desperately want to see manta rays. Manta rays do not come alone here. A few dozen tourists skirt the area at feeding time. And feeding time is well defined: at the pass, when the tide starts receding, the mantas tend to come in to feed. Swarms of mackerels greet us first. Plenty of other small fish starts surrounding us as if we would protect them. The first day, that’s it. 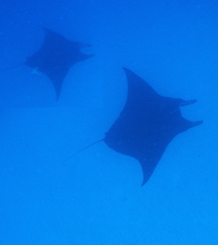 The second day, at the very last, somebody spots two mantas. Like a tourist stampede everything that can move approaches the area where the mantas are. People dive down like plunging birds that feed on fish. Luckily, most do not make it down to the mantas. Only two get down to enjoy the view from bottom up, me amongst them. It’s a mixed feeling, as the mantas really just make a brief loop through this area that the locals call the manta cleaning station. I hope they are doing their usual feeding and are not (too much) affected by all the humans going crazy around them. 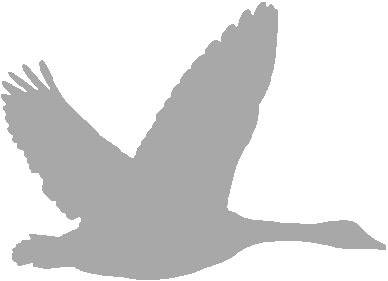 They do not have to, as they are super fast despite their seemingly slow wing movements. While I struggle to keep up with them with my long free diving fins, they munch on the plankton while causally drifting by. I get a fair exercise of high speed swimming while still trying to keep my breath diving 10m down to them, leaving the crowd far behind. Exhausted I swim back to Isa and the dinghy, still feeling some plankton hitting my face. This must be good feeding grounds. The pace is up on our journey. We want to be in Australia by November, as I found a job opportunity. While visa etc is being organized we want to get the ship to down under. Therefore the day after seeing the mantas we start the engine to motor-sail towards Vuda Point, our last stop here in Fiji. Clearance and a birthday party are awaiting us. Furthermore we need to stock up on fruits and veggies before catching the next weather window to sail to New Caledonia. From New Caledionia it’s the last leg to Australia. The cruising community seems to split here: a bunch of boats are to be sold in Australia or New Zealand, some stay over cyclone season in the south to return, some will head on west while very few plan their journey north, back to the Pacific North West. Our friends on Merrion already spread the sales add through their social network. We are keeping our options open as we approach Australia - from selling to skipper-chartering to weekend-sailing all may be possible for Jade Akka. So after saying good-bye to Merrion together with Quan Yon, another Seattle area boat, we provision in Lautoka community market, enjoy the marina restaurant, get our ship ready (inspection from top to bottom, luckily no planned repairs just minor touch ups and standard maintenance) and organize our own outward clearance.